On Saturday my boyfriend and I went to the beach in hopes of catching some much needed Vitamin D. Seeing as how we’re both Scandinavian, we’re more than a bit on the fair-skinned side of the spectrum and we certainly caught more Vitamin D than we bargained for, despite using SPF 50…sad day! I blame it on the fact that we forgot our nice natural sunscreen at home leaving us no choice but to buy an icky chemical one in desperation to prevent getting sunburned any worse. Despite all that, we still had a nice relaxing day laying out on the sand amusing ourselves by the fact that we must have been blinding everyone else on the beach. It’s easy to underestimate the power of the sun when we’re having fun outdoors. Having pre-made sunburn remedies on hand to take the sting out, reduce redness and inflammation, and prevent peeling is definitely useful, especially since sunburns only take a few short hours to get uncomfortable depending on severity. Trying these simple homemade recipes will help lessen discomfort and the time it takes to heal. The botanical ingredients are known for their ability to pull heat, offer relief, and assist regeneration. • Make sure to “pull out” as much heat from the sunburn as you can FIRST. You can do this by taking a cool shower or bath (try adding vinegar) or apply a cool compress. Do not use ice for this. • Do not apply any moisturizers or oils. These can lock in heat. Making a strong herbal tea using healing and regenerative herbs will heal sunburn quickly and efficiently. I like using Calendula by itself as a strong tea or combining it with other herbs that have an affinity for healing the skin. • Pour boiling water over the herbs and steep until cooled. Calendula is a wonderful herb to use for inflammation and stimulating new cell growth, it soothes and calms sunburn within a few applications while preventing infection. Horsetail is rich in silicon, an essential nutrient needed for youthful, smooth, supple skin. Sunburn tends to dry up and dehydrate skin making it appear dull. The high silicon content in horsetail will prevent “aged” skin while assisting the healing process. Comfrey leaf promotes cell regeneration and reduces sunburn inflammation. It’s one of the best herbs I’ve used for hot, irritated burns. St. John’s Wort is such a sunny herb in itself. I recommend keeping it as a close ally for those of us who sunburn easily. The oil that is extracted from its medicinal flowers alleviates the pain caused by sunburn and heals it fast. • Seal the jar tightly and store outside in the sun or on a sunny windowsill for at least 2 weeks. The oil will turn a vibrant ruby red color. • Strain and store in a clean dark glass bottle. • Apply often on sunburned skin AFTER heat has been lifted. Can I just say that rose vinegar is AMAZING? The rose, as delicate as it may seem, is as tough as its thorns when it comes healing. And boy does it heal! • Fill the jar all the way up with fresh *fragrant* rose petals. If you’re using dried petals, fill the jar halfway. Your rose vinegar will turn a lovely shade of pink and can be used for all manner of burns, cuts, scrapes, sprains, and bug bites. • Shake and apply as often as needed. Rose vinegar will lift heat and redness from sunburn in no time flat! It reduces pain quickly too, and can almost completely remove a mid-range sunburn within 6-8 hours of repeated application if caught in the first 24 hours. Rose vinegar can even greatly lessen the pain of blistering skin. To cover large areas, fill a *glass* bowl with several cups of spring water. Add about a ½-1/3 cup of rose vinegar and stir to incorporate. Dip in a cotton cloth, preferably one that is soft, and apply it to sunburned areas repeatedly until the heat has lifted. It’s important to re-dip the cloth in the vinegar solution as soon as the cloth gets hot. This can take more than 10 applications. 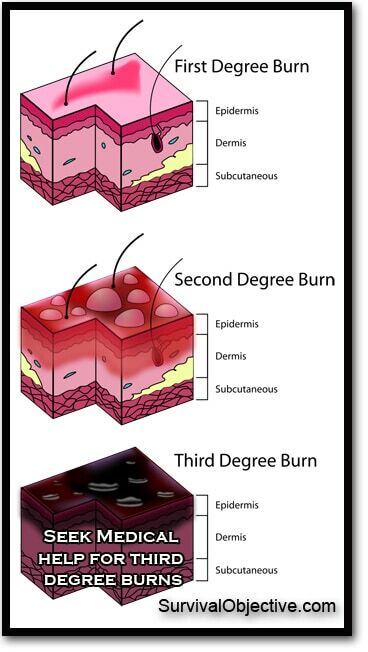 For mid-range burns, apply every 1 ½-2 hours. For severe sunburns, apply every hour or even more often than that if needed. To prevent infection of severe burns, you can apply Manuka Honey or fresh from the leaf aloe vera gel between treatments. You can also use this high-quality aloe gel. Can’t Wait 6 Weeks for Rose Vinegar? You can simmer rose petals in raw apple cider vinegar or even plain white vinegar in a pinch on very low heat until the rose petals lose all of their color. Strain and cool, then apply as described above or add to a cool bath. This version should still help quite a bit. One of the easiest and most effective remedies for sunburn is, of course, aloe vera. This demulcent herb is perfect for any stage of sunburn but is most useful when applied as soon as you suspect burning. It’s cooling and soothing properties reduce redness and inflammation, especially when used fresh. It can be used alone or with other sunburn soothing ingredients to provide immediate relief and hydration. • 2 oz pure aloe vera gel. I scoop it straight from the leaf, blend it, then strain the pulp. If you purchase it from the store, make sure the gel is as pure as possible. • 2 oz lavender hydrosol (lavender water). You can steep a strong lavender tea if hydrosol is not available. Peppermint is wonderful for pulling heat. It’s very cooling and provides quick relief for sunburned skin. Combining it with strong green tea will reduce redness and inflammation. • Steep 1 bag of green tea with 1 bag of peppermint tea together until cooled. Keep covered with a plate to trap in the medicinal volatile oils. • Pour the tea into a 4 oz spray bottle and add the peppermint essential oil. • Shake well and keep chilled for best results. Green tea boasts some powerful anti-oxidant properties that help repair sunburned skin. It can be used before, during, and after sun exposure to help reduce redness, inflammation, and the effects of UV rays. Soak a cloth in cooled, strongly brewed green tea and apply to sunburned skin. Don’t forget to sip on some iced green tea while you’re at it! Sometimes we don’t have time to make remedies because we need relief RIGHT NOW. In times like these, you can use simple 1-2 ingredient remedies that don’t require brewing and cooling time or any real recipes. • Fresh (or as pure as you can find) aloe vera gel applied liberally and often. Try keeping a fresh leaf in the freezer…the gel will be super cooling but not turn to ice! • Lavender essential oil- Mix 5-10 drops into aloe vera gel and apply directly. • Plain full-fat yogurt- Apply to sunburned skin to help pull heat. • Raw apple cider vinegar- If you catch sunburn fast enough, you can stop the sting in its tracks. Spray straight onto skin or dilute in a little bit of water. I’ve soaked in a bath with vinegar before will great results. • Slice some cucumbers and apply the slices to sunburned skin. • Peppermint essential oil and aloe vera gel. I use quite a few drops for this and let me just say *siiigggggghhhhhh* such RELIEF using this! The peppermint really takes out the heat and sting. • Cool oatmeal bath. Put oatmeal in a sock and tie the end. Swish it around the bath to cloud the water with the healing power of oatmeal! Try adding baking soda to the bath too! What’s you’re tried and true natural remedy for sunburn relief?